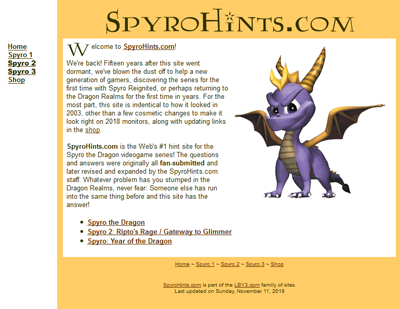 With the release of the Spyro Reignited Trilogy on Tuesday, I went and dusted off a website I first created in 1998 and haven’t updated since 2003: SpyroHints.com. One person counseled me to fully update the site to modern standards, but there’s something fun to me about the 1998 Web aesthetic, the animated Harry Potter knock-off logo, etc. Hopefully others feel the same way and, more importantly, still find it useful in 2018 and beyond. I love the 2003 look to the website. Please keep it that way. Just bought the remastered spyro and I am using the site. Nice work keeping it up all this time. I remember Spyro. Sweet 2003…Now I am working at https://best-vegas.com/upcoming-concerts/ and I have an opportunity to visit sometimes some great events. Everything that connected with retro games is my favorite. Thank you for your work!